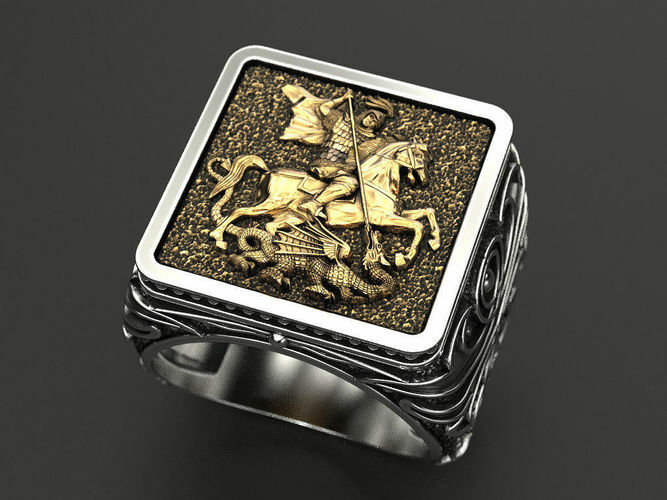 This is a beautiful signet ring of the iconic slaying of the dragon by St. George. The emblem is based on the sovereign coin of the british realm. The image representative the protective sovereign man, St George, the knight who defends the world against evil. sizes in USA: 9 | 10 | 11 | 12 Recommended material - silver or gold! Approximate metal weight (for ring size 20 mm): gold 14k – 26.5 grams; gold 18k – 31.7 grams; silver 925 Sterling – 21.3 grams. Model volume (for ring size 20 mm): 2052.57 cubic mm. Model avalible in STL format for prototyping. Geometry is healed, and fixed all the bad with RP Magics software You can check out my other products by clicking on the author name artchagur. Any questions? Please contact me. Thank you!